Is That You? is an intense psychological horror story. The Cuban movie (org. title ¿Eres tú, papá?) is brutal in many ways. Often through action and behavior rather than words. Screened at CPH PIX 2018. Is That You? is very different from any other movie from Cuba. Instead of a hyper and colorful story, we’re faced with a beige and brown world where everything moves slowly. The pace drags along. And not just because one of the characters walk around with her ankles bound together. Even if this does obviously create a character that literally has to take tiny steps to move forward. The pacing is very deliberate. Not just for the story, but as a way of describing this world. Not only are bright colors removed from the world in Is That You? (Org. title ¿Eres tú, papá?). All the joy, happiness, and hope seem to be gone as well. The relationships are all toxic and loaded with various strange commitments. Not much of the past is revealed even though it is established that something has happened. This was a pretty big issue for me. Even though I can appreciate this world, I felt a need to know what had gone wrong. Or at least, how things were before it all went wrong. The actions and questions from both the daughter and the hired help, lead me to believe that things were different not so long ago. And yet, for the girl’s actions and mental state to really make sense – to me, anyway – it would require a lifetime of brainwashing. Again, I have to admit that while I appreciated the way the story was told, I can’t really get behind the story itself. I felt no real sympathy for any of the characters except the mom. I feel like I should feel for the daughter. At least at some point. But none of her actions or words gave me any reason to sympathize with her. Sure, she’s only supposed to be 13-14 years old. And she is very much controlled by her dad. Still, she also sees other people in the world every day. Also, we are all instilled with some feeling of right and wrong. Sympathy and empathy are other natural emotions that most people do not need to be taught. Just look at how even young kids react, when someone else is sad. It felt like I was supposed to believe the daughter wanted her father all to herself while also fearing him. And somehow also wanted to be her father. But then she also kept working on getting her dad to treat her mom better. Yet, when her mom had the chance for a better life, she fought against her. I guess I just needed some rhyme or reason. Unless the explanation is very simply that she was born with serious mental issues. If that’s the case, then the movie is an entirely different creature than what I felt it was trying to come across as. Is That You? is a fascinating and brutal watch for the style of filmmaking. I cannot falter this and would love to see a movie from writer-director Rudy Riverón Sánchez where I also care more about the story. Rudy Riverón Sánchez mentioned directors like Roman Polanski and Lars von Trier as inspirations. He likes to provoke as they do. And clearly, he also seems to share their view of women a bit too much for my liking. It seems like women can be the victim or the villain. Just not the hero. Not that there is any hero in this movie. Even if Carlos was somewhat of a hero – in my book anyway. This was the debut feature film from Rudy Riverón Sánchez, and I feel confident we’ll get to see a lot more from him. And also from the star of this movie, Gabriela Ramos, who portrays the young Lili with a downright creepy intensity. Is that You? (or ¿Eres tú, papá?) is currently playing at film festivals all over the world. 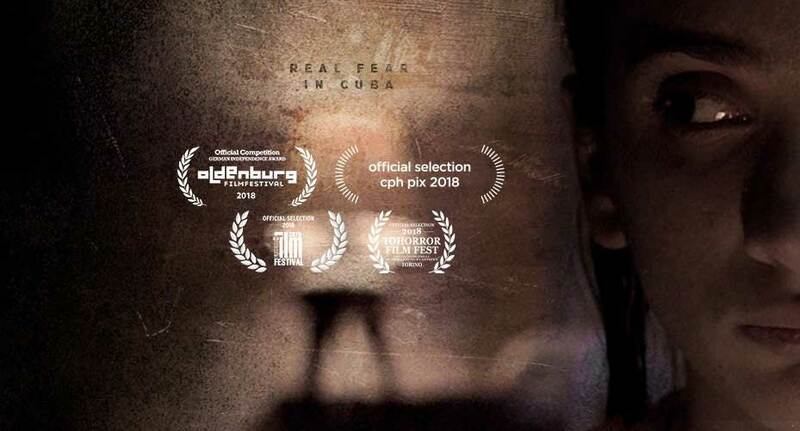 Living in a modest shack in the Cuban countryside, thirteen year old Lili and her mother appear trapped in a meagre, suffocating existence by her domineering father, Eduardo. His sudden absence should represent a new freedom for the girl and her mother, but Lili is distraught, and we come to discover just how strong the influence of this monstrous man is over his family. In desperation at losing Eduardo, Lili carries out a ritual taught to her by a spiritualist to help bring him back, leading Lili to uncover a disturbing truth about her father’s disappearance.